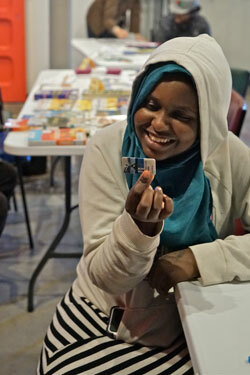 Asma, a Somali-born mother living in the Minneapolis, Minnesota, community of Cedar Riverside, made typical use of her local Hennepin County library: checking out books for her children. However, like many of her fellow Cedar Riverside residents, Asma didn’t see herself as a recipient of library services, even avoiding spending long periods of time at the library because she felt it was necessary to keep her children quiet. In December, after a lot of hard work, Asma completed a phlebotomy education program and now wants to pursue her nursing degree. It was a journey that began when she opened herself to services the library had for supporting higher education and career growth. 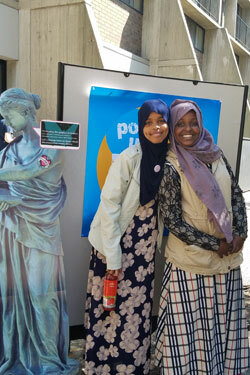 Like Asma and many other residents of the urban neighborhood south of downtown Minneapolis, Cedar Riverside members could benefit greatly from library services. The neighborhood has high unemployment and lower achievement in education than the rest of the county, with many living below the poverty line—and only 31 percent of Cedar Riverside residents had a library card. And although there are three Hennepin County libraries within three miles, none are directly in the neighborhood, and geographic barriers present additional challenges to access. Through IMLS Grants to States funding, the Hennepin County Library (HCL) began identifying ways to promote lifelong learning and continuing education in Cedar Riverside. In 2015, HCL began examining what library services would look like beyond the building’s walls. The library hired Abdi, a Somali-speaking community member who had lived in Cedar Riverside for 19 years and who had a wealth of neighborhood connections. Abdi would develop partnerships with community stakeholders, build a network of volunteers, and serve as a main advocate for HCL. 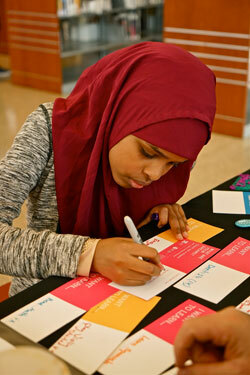 Abdi worked with the neighboring libraries to provide cultural competency training. She focused her training on broadening cultural understanding around topics such as prayer, physical contact, and holidays. Additionally, the libraries’ outreach staff took part in neighborhood walking and listening tours, which had a strong influence on the project’s future. As the project gained momentum, it became imperative that connections made in the neighborhood be meaningful and lasting. Because of the importance the Somali culture places on in-person, oral communications, HCL needed to have a network of individuals who could provide face-to-face contact in a comfortable, familiar setting. 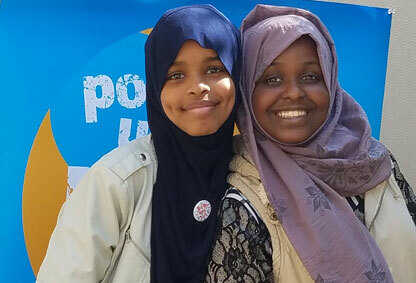 With the help of Abdi and the staff at the neighboring libraries, community members were identified, recruited, and trained as volunteer ambassadors. In the course of a year, 20 community members became library experts and advocates, evolving into an essential resource for the library within the Cedar Riverside community. Some of these ambassadors had never before had a library card, and some volunteers had limited English skills. Training involved bilingual classes, digital literacy, and guidance on how to support individuals’ school and career goals. After training, these ambassadors helped staff welcome events and pop-up libraries, and became familiar faces for the library in Cedar Riverside. Most importantly, the ambassadors found a home in the library themselves. In evaluation surveys, 100 percent of the ambassadors indicated they use the library more often after having served in the volunteer role. “Our volunteers really began to see themselves in the library, which was one of our biggest goals,” said Stade. With a cultural liaison and a team of advocates in place, it was time to bring the community the services they had long wanted. 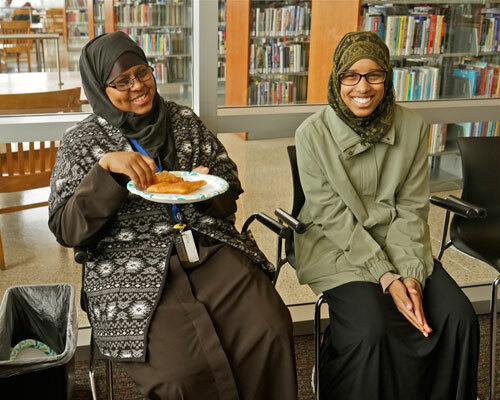 The neighboring libraries hosted welcome events that introduced the volunteer ambassadors to the community, allowed families to experience the libraries’ atmospheres, and built relationships between library staff and the Cedar Riverside Somali community. During the events, staff highlighted services and materials of particular relevance to the community, including job search services, support for academic achievement, and children’s literacy programs. Evaluation surveys showed that 96 percent of welcome event attendees would visit the library again and 79 percent would tell a friend about the library. A key element aspect of HCL’s outreach was six pop-up library events that brought the library experience directly to Cedar Riverside and demonstrated the library system’s commitment to the neighborhood. 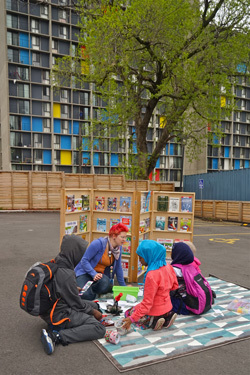 HCL brought temporary libraries to community centers, high schools, apartment buildings, mosques, and playgrounds, reaching the people where they gathered. During these pop-up library events, community members were able to sign-up for a library card, check out books, gain technology skills, meet with staff, and become familiar with the services offered by the nearby libraries. Mobile technology kits that included iPads, laptops, a projector, and a mobile print station helped emphasize the digital resources libraries offer the community. In one year, nearly 800 community members attended the events and 181 new library cards were issued. An important partner resulting from the outreach project was the Hennepin County Law Library. Pop-up library events held for the community connected community members with relevant legal resources, helping community members understand landlord and tenant rights and employee rights. Over the course of a year, 85 community members were connected to the law library directly through community outreach events in Cedar Riverside. In just one year, HCL bridged the gap between their libraries and an immigrant community, carving out a space in the library where members of Cedar Riverside could feel connected to home. Additionally, staff are more confident and sensitive when serving these patrons, and feel they are able to be more responsive to their needs. Residents continue to be enthusiastic about HCL’s online resources, tutors, language training databases, and career support that the library provides. Lessons learned from the project also aided in building sustained work in the community through the Cedar Riverside Opportunity Center. A collaborative workforce development program established in partnership with the library system, Hennepin County Workforce Development, the City of Minneapolis, Minneapolis Community Technical College, and local nonprofit EMERGE, the center supports workforce development and educational attainment in the county. In the years to come, HCL will continue serving the Cedar Riverside community as well as other communities using this outreach model. As the initiative continues, the most important lesson for Hennepin County Library is realizing that barriers could be anything and anywhere.